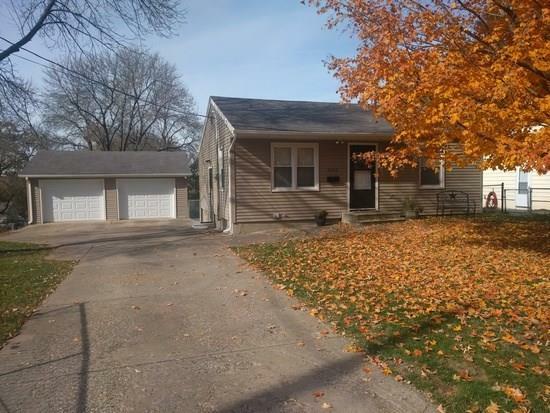 Cozy one story ranch on half acre corner lot with mature trees! Original hardwood floors in main living area and two bedrooms with comfy carpet in the master bedroom. New laminate wood flooring in good sized dining room in 2015. New ceiling fans in all bedrooms, living and dining room plus new windows, gutters, siding on house and garage, garage doors (new openers as well) and deck. Updated bathroom in 2015. All windows have white 2-inch faux-wood blinds. The master bedroom conveniently adjoins to one of the other bedrooms, perfect for small kids, study or craft room. Enjoy the over-sized 2 stall garage (528 square feet) plus small storage shed in back. Fully fenced yard with raised garden bed and compost area if desired. Sellers will leave Craftsman lawn tractor (20HP, 42" Mower) if desired. This home has much to offer inside and out!